Mind your thumb: Your thumb needs to be right in the middle of the back of the guitar neck, so you'll be able to pinch the guitar inbetween your thumb and index finger, and exhert enough pressure to hold down the required strings. 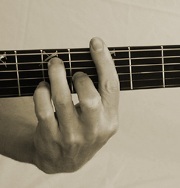 Mind your index finger: You'll need to place special attention on your index finger when fretting bar chords. It needs to be close to and parallel with the fret wires, and not laying face down flat, but rolled onto its side. Mind your wrist: Experiment with different wrist positions when practicing barre chords. Generally, moving your wrist forward will improve your bar chords by 100% already. Try it! Mind your elbow: Place your elbow closer to your body, than you would otherwise. This will enable your index finger to roll onto its side more, which makes it easier to hold down the strings. Don't hold too hard. Your hand shouldn't get numbingly tired, you are probably holding down way too hard if it does. Concentrate more on the techniqual aspects of fretting bar chords, rather than the muscular ones. Practice a couple minutes every day: Believe me when I say that just a few minutes of practicing and concentrating on bar chords will develop your ability to play them by 400% in just a week or 2. Watch other guitar player: Head on over to YouTube and search for videos where people are using bar chords in songs. Watch their hand movement, you'll learn a lot. Play songs with barre chords: Learn by doing, as my grandpa always said. Once you can somewhat play bar chords, learn easy guitar songs which use them. Remember that the key to playing bar chords is practice. Just keep at it, and you'll see that with time, playing bar chords will get easier and easier, until it will become natural. Thats the way learning the guitar works, all it takes is patience and practice. Tips for tendonosis (chronic bilateral). I so want to play again. Thinking of a parlor size. Playing my tenor ukulele now. Guitar- have not played for 2years! Thank you for the reply. Sorry, I don’t have any experience with students who have tendinitis. Hope you find an answer! This tip for moving wrist forward has already helped me a lot. Everyone should know about this advice. Really helpful.